Home | Practice Areas | Social Security | How Long Does It Take to Get a Decision About Social Security Disability? Studies show that 25% of Americans will probably need to apply for Social Security disability benefits before they reach retirement age. It’s important you know how to apply so you can obtain a successful outcome. And, of course, you’ll want to know how long it takes to get Social Security Disability Insurance (SSDI) benefits or Supplemental Security Income (SSI) Benefits. Who Qualifies for Social Security Disability or SSI Benefits? Can My Child Apply for Social Security Disability Benefits? How Long Does It Take for Social Security to Make a Decision? If I Am Approved, How Long Will My Benefits Last? If I Work With a Lawyer, How Much Will They Charge? If you’re still earning more than $1180 a month, the Social Security Administration (SSA) will not consider you disabled. Have a medical condition that is either diagnosed as terminal or will last at least one year and prevents you from working — short-term or partial disabilities do not qualify. There is a list of adult impairments that fall under Social Security, and you check and see if your condition qualifies. Fall under the Social Security Administration’s definition of disability. Be younger than the age at which you qualify for retirement benefits from the Social Security Administration. What Is the Difference Between Social Security Disability Insurance Benefits and Supplemental Security Income Benefits? While both programs are run by the SSA, and the medical requirements for both programs are the same, the two programs are very different. You cannot have more than $2000 in assets individually or $3000 for a couple. You need to be earning less than the $1180 mentioned above. Social Security will pay SSDI benefits to you and sometimes to members of your family if you qualify medically and have worked — either for a business or self-employed — and paid Social Security taxes. You receive one credit for each $1320 of wages you have earned. Normally people filing for SSDI benefits need to have earned 40 credits, 20 of which must’ve come in the last 10 years. Younger disabled workers require fewer credits. How Long Does It Take to Get Social Security Disability Benefits After You Are Approved? If you qualify for SSI benefits, you start receiving them within the first month that you are approved. In 2018 the SSA pays an individual $750 a month while a couple received $1125. Some states add extra funds to the federal SSI benefit. SSDI benefits will not be paid until five months after you have filed your initial claim — which is why it’s important to begin the process as soon as possible. As we show below, there can be considerable waiting times involved. If your initial claim is approved, which normally takes 3 to 4 months, you will receive your first benefits payment in about 1 to 2 months. In 2018 the SSA can pay as much as $2800 a month in SSDI benefits if you include payments to family members but the average is closer to $1200. States do not offer added funds for SSDI benefits. You will also be automatically enrolled in Medicare after two years if you have qualified for SSDI. Yes, a child under 18 can apply for Social Security benefits if they meet the SSA’s requirements. The child’s family also must have limited or no income — there are several rules in place especially if your child meets the criteria as an adult disabled before the age of 22. They must suffer from a disease or condition that inhibits their ability to fully function. There is a list of childhood impairments that you can check for children under the age of 18. As with adult disabilities, their condition must be expected to last at least a year or be terminal. The Social Security Administration does not set a time limit on disability claims. So, it’s hard to know how long it takes for Social Security to make a decision. Or how long it takes to get Social Security Disability benefits. The time limits below are based on the average time a claim may take before a decision is made. Some times may be shorter, some longer. Decision times also depend on where you live in the country. Once you file an initial claim, the average response time is 3-4 months. If the initial claim is denied, the average response time for a reconsideration appeal is also 3-4 months. If your reconsideration appeal is denied, the average time for a hearing appeal before an Administrative Law Judge (AJL) can be anywhere from six months to two years. You can visit the Hearing and Appeals page on the Social Security site to see the average wait time for your area. If your claim is denied by an AJL, you can continue with your claim by filing an appeal with the Appeals Council (AC). If the Council accepts your appeal, it can take up to a year before it renders any decision. If your claim is denied by the AC, you can appeal to a federal district court. Most courts take about eight months before reaching a decision. People who file for Social Security Benefits need patience. Most people filing an initial claim will be turned down. 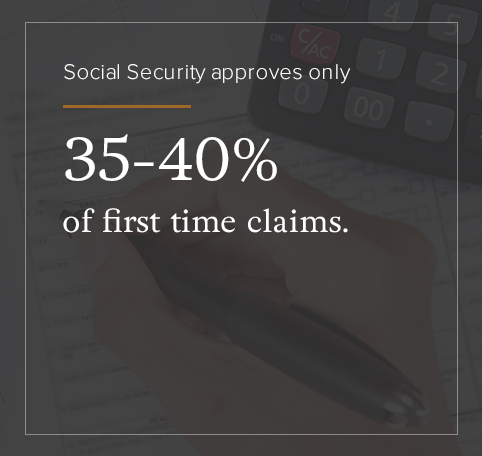 Social Security approves only 35-40% of first-time claims. The line is long. Currently, about 1.1 million Americans are waiting for a decision on their disability claims. Normally claims increase at time of high unemployment. Since 2000, the number of American receiving benefits has increased from about 3 million to 8 million in 2017. If you include spouses and children who also receive benefits, the number climbs to 11 million. What Is Backpay and How Do I Receive It? You are eligible to receive SSDI or SSI backpay for as long as the previous 12 months starting from the date you file your initial claim — provided you have been unable to work during that time. This may result in quite a sizable benefit. For instance, if it takes two years from the time you file your initial claim to be approved, this means that you could be eligible to receive up to three years of back pay. The SSA will determine how many months you are eligible for backpay based on the date when the disability prevented you from working. Can I Work a Little While Waiting for Social Security Disability Decision? It’s important to know that you cannot work at any time after you have filed for a Social Security Disability benefit or a SSI benefit. You can’t deliver papers, mow lawns, work behind the counter in a store — no work at all. If you work, even a little, you will be turned down. The disability approval rate among judges over the past few years increased nationwide. That’s why it’s important that if possible you prepare financially for a long wait before your appeal is approved. How Can You Speed up the Social Security Disability Process? TERI: If the applicant has a terminal disease or condition. You don’t need to report that you have a terminal disease, although you can. The SSA can determine this from your medical reports. A field officer can identify a condition as terminal during an interview or the condition can be brought to the attention of the SSA by anyone helping you with your claim. Quick Disability Determination (QDD): Allows you to file your initial claim electronically. The SSA uses a predictive model that helps it analyze this claim to see if it warrants fast-tracking. You must be suffering from a serious condition and have medical evidence to prove it. If a claim meets the requirements, it will receive a faster decision. Compassionate Allowances (CAL): Helps Social Security evaluate claims more quickly based on certain conditions. The SSA receives information from the public and a variety of different groups to determine what conditions qualifies for a CAL. If your application meets the requirements, it will receive a faster decision. How Do You Improve Your Chances of Receiving a Positive Outcome? There are no guaranteed ways for you to either speed up the time it takes Social Security to reach a decision about a claim or to receive a positive decision. But there are things you can do to improve your chances. Stay with your claim: Your chances of being approved increased as you continue with the process. Remember, if you are not approved until the second or third step of the appeal process, you could receive a sizeable back pay allocation. Preparation is key: Have proper medical records ready.The more up-to-date your medical records, the greater your chances of success. If you don’t have the proper medical paperwork, judges need to order examinations by an independent doctor. The SSA will pay for this examination, but doctors are notoriously slow in arranging these visits. And they often don’t send in their reports by the two-week deadline. This can considerably lengthen the process. List all your ailments: Both medical and physical on your application. Provide a clear and accurate record of your work history: It should include all aspects of the job such as effort required, if you had to lift anything, hours worked and rate of pay. All these things will be used to help determine if you qualify for SSDI or SSI benefits. Hire someone to help you: Statistics from the Government Accounting Office (GAO) show that when a claimant hires a lawyer to help them, they are three times more likely to have their benefits claim approved. Once you receive approval for either SSDI benefits or SSI benefits, you are eligible to continue to receive them until you reach retirement age when you will be placed on Social Security retirement benefits. It’s important to know that the Social Security Administration will conduct periodic reviews of your condition. This can be as often as every two years or as infrequently as every five. The average is every three years. Benefits will only be removed if the examiner determines that your condition has improved enough for you to be able to return to work. If you don’t agree with this decision, you may appeal it. The SSA limits how much an attorney can be paid when they work on your case. The SSA must approve any fee agreement worked out between you and your lawyer. They can only receive up to 25% of your back pay if your application is successful, but you and your attorney can decide on that. If your case is unsuccessful, you won’t pay a penny. Remember, when you work with someone on your claim you triple your chances of receiving a positive outcome. KGB Injury Law offers our clients deep knowledge and experience in filing Social Security claims. We believe that all our clients should be treated as people and not just as cases. We understand that suffering a serious disability and the financial and emotional hardships it can cause create real problems for people. When you work with us you can count on the highest ethical standards. We care deeply about how we treat the people who choose to work with us throughout the entire disability claims process. Your success is our success. You can get a free consultation, 24-hours a day, on our toll-free line (800) 509-1011. Or visit our webpage and tell us about your situation and why you want to file a claim. We will contact you and discuss establishing a relationship to help you with that claim.